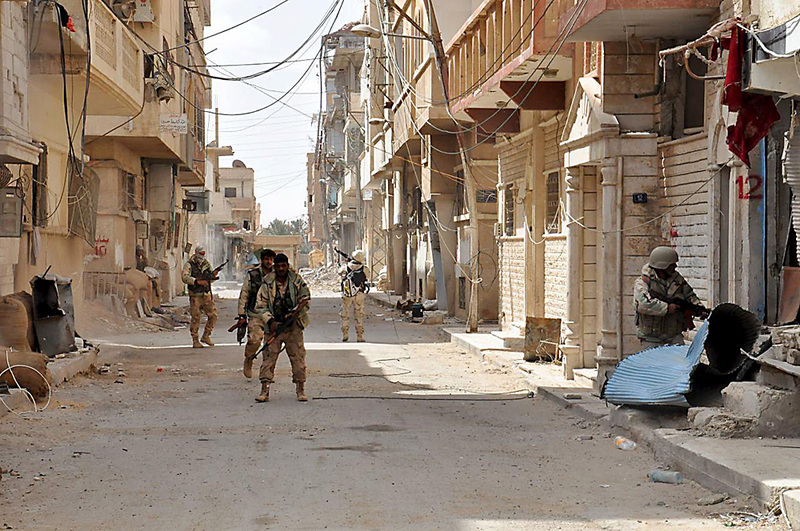 Forces loyal to Syria's President Bashar al-Assad walk with their weapons in Palmyra city after they recaptured it. Cooperation between Russian and American servicemen, who are secretly working together in Syria to combat ISIS forces, is inevitable and unavoidable, say Russian analysts. The liberation of Palmyra by the Syrian army recently and successful forays by Kurdish units on the way to Raqqa, the de facto Islamic State (ISIS) capital, are the result of coordinated efforts of Russian servicemen and the American-led anti-terrorist coalition, despite the absence of official agreements outlining such coordination. Russian politicians and analysts believe that although Washington does not wish to acknowledge cooperating with Moscow, it will be impossible to do otherwise in Syria. Pyotr Vodolatsky, deputy chairman of the State Duma Defence Committee, said the American military is cooperating with the Russian military in Syria, despite the absence of official agreements. Vodolatsky said the evolution of Russian-American cooperation in Syria resembles the anti-Hitler coalition during WWII, when Western countries opened a second front only after decisive victories by the USSR. "We had made proposals to European countries and to the U.S. to coordinate actions to destroy the terrorists, but England, France and the U.S. refused, and so we had to start eliminating the terrorist organization by ourselves," said Vodolatsky, about Russia’s Syria operations. The close coordination between Russian and American servicemen in Syria is not, however, being admitted on an official level. "From the very beginning we proposed to coordinate our military actions on the ground so that there would not be any questions as to who is striking the correct targets and who isn't," Russian Foreign Minister Sergei Lavrov had said in February. "We wanted a joint, honest process, but were always met with a refusal. Our only accord was a memorandum on the prevention of incidents in the sky." Observers say that the course of combat activities bears witness to the contrary. Bloomberg wrote on April 7 that actions of the Syrian army and the Kurds are increasingly beginning to resemble a well-planned operation whose aim is to trap ISIS forces in a pincer and cut them off from Iraq. Russian analysts point to the fact that without close interaction, both the US allied forces and the Russians would have inevitably launched attacks on each other, as not only were their air forces operating in Syria but also their special forces, something that has been openly declared on many occasions. "Within that agreement on the prevention of incidents some kind of mechanism for exchanging information must function, communication channels must always exist and through these channels other activities can also be discussed," explained Vadim Kozyulin, senior scientific collaborator at the Centre for Policy Studies in Russia and professor at the Academy of Military Sciences. "There is an objective necessity for Russian-American cooperation. Information is probably exchanged not only concerning aviation but also for actions on the ground, so that the sides do not strike each other." Kozyulin believes that the U.S. is concealing its interaction with Russia for political purposes since Washington has often criticized Moscow for its policy in Syria and now cannot be open about the cooperation. "The politicians are incapable of admitting it since Russia and the U.S. currently have complex relations. But life forces us to cooperate in order to avoid losses due to friendly fire," said Kozyulin. Will Russia make money from Syria operations?